If we're going to be friends, one thing you should know about me is that I am obsessed with chicken pot pie. 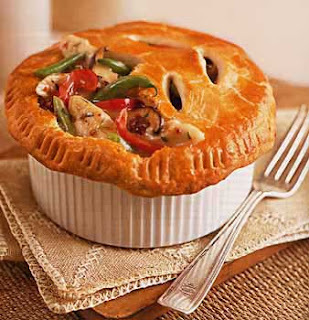 There is something about that creamy combo of fresh veggies and meat and pastry that really sends me to the moon. I've never met a pot pie I didn't like. When I first moved to New York and was living in a tiny apartment with two other girls, and was "cooking" for myself for the first time, I would eat at least two frozen Stouffer's pot pies per week (I found them far superior to the Banquet brand in flavor, and much less expensive than Marie Callender's, that dirty swindler), until I finally read the back of the box and realized that that was why my chins had doubled in number. Since then, both my cooking skills and my nutritional sense have improved, but my insatiable appetite for pot pies has not changed a bit. In order to get my fix without going up a pant size, I have tried every "lighter" chicken pot pie recipe in the book, and I have a lot of new favorites. In fact, the only reason it has taken me so long to do a post about pot pies is because I have so many favorite recipes, it's hard to choose. So I am attaching the links to several really good ones, and I'll let you choose. After all, you can take the girl out of the tiny starter apartment, but you can't take the pot pie away from the girl (without getting a black eye). So now you can pot your pie without popping a button.